Basketball Betting supports responsible betting. Please visit BeGambleAware.org for more information. 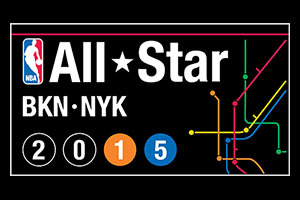 So the West won in the All-Star game, defeating the East by a margin of 163-158. It was a night of glamour and half of the pre and post-game interviews were from players talking about the fashion show and their own line of sneakers, but for people that loved basketball, there was at least some action to enjoy. There were plenty of dunks, plenty of three points and a whole lot of points for people to cheer on and folk that enjoy the All-Star game definitely had their fill of fun on Sunday. One man that definitely had a brilliant time on Sunday evening was Russell Westbrook. With the West winning in a convincing manner, it is probably only right that a player with West in his name was the star man in the big game. He managed to grab himself 41 points for the winning team and he was the Most Valuable Player in the game. Grabbing the MVP in the All-Star game is definitely something to be proud of but if things had gone a little better, he may have written himself into the record brooks. The 41 point tally for Westbrook was highly impressive, but it was just one points short of the All-Star record of 42 points. This was a point tally set back in 1962, so it has been standing for more than 50 years! It was close to being defeated, but Westbrook just fell short. He was a little bit annoyed with some of the points he missed, Westbrook realises how close he was to creating a bit of history for himself, but in the end, he will have to settle for lighting up the Garden on a night when plenty of people were looking to sparkle and shine. In off the court news, it looks as though LeBron James is looking to be an even bigger influence on the game. Given some of the performances the King has delivered in recent times, you may struggle to think how is this possible, but news has emerged of LeBron taking on a new opponent. He is all set to become the First Vice President of the National Basketball Players Association, the NBPA. He will team up with Chris Paul as the NBPA gears up for a massive contest. The organisation is aiming to battle the league with respect to labour negotiations. The current bargaining agreement that is in place is scheduled to run until 2020-21 but there is a break point in December 2016, and this is clearly the key issue that is vexing so many people. With the NBA having a new $24 billion contract (for nine years) in place with ESPN and Turner, there has been a lot of talk about the NBA looking into ways to bin the collective agreement as soon as they can. The NBPA is also looking for a way to opt-out of the agreement, with many in the organisation being sick of the teams being sold for huge sums of money while the income of the players being related to the BRI, the Basketball Related Income. Getting LeBron involved in a very noticeable way has to strengthen the hands of the NBPA. He is a man that is known well beyond the standard sphere of basketball, and he is a man that demands respect, attention and of course, he fills headlines and column inches. If LeBron steps up and adds his media presence to the NBPA fight, they are going to be in a much stronger position than if he was just like any other player in the background. BasketballBetting.co.uk is a subsidiary of Visual Sense. Follow BasketballBetting.co.uk on social media and stay up to date at all times!